Things I'm reading: After being home for months, I finally took a trip to my favorite local library, renewed my card, and took out five books that I'm so stoked to read. 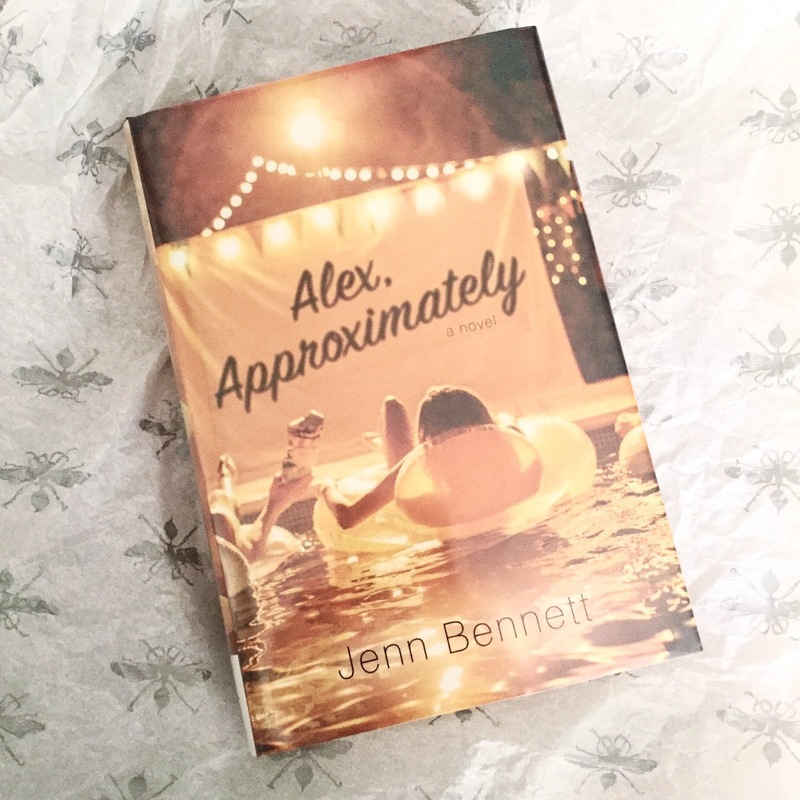 I picked them up on Monday and powered through the first book at the top of my pile, which was Alex, Approximately by Jenn Bennett. It's essentially a modern day, teen-version of You've Got Mail and it was addicting as all hell. I could not put this book down. I read all but about, like, 50 pages in one sitting yesterday and I was legitimately screeching towards the end. Seventeen-year-old Bailey "Mink" Rydell moves from New Jersey to D.C., then to a surf town in California to live with her dad post her mom's remarriage. In the midst of this, Bailey has been talking to a guy called "Alex" online under her nickname "Mink" in a film chat room. Ironically, Alex lives in the town that Bailey is moving to, but she doesn't tell him right off the bat. Instead, she pretends that she's still living on the east coast while she makes a life for herself in her new home, including a new job, new friends, new drama, and of course, a new boy, Porter Roth. Even if the sleeve of this book spoils the ending (and also, you know, the fact that it's inspired by You've Got Mail), I will spare y'all the actual ending. All I have to say is that Bailey's banter and arguments with Porter had me gripping the book so tightly in my hands. It was a wild ride, y'all. Those two were so clever and witty and I was on edge the whole time. A good edge though. Not a nervous edge. If you like YA, surfing, vintage dresses, and classic movies, you'll like this book. A lot. Like I recommended getting it now and reading it in one sitting because that's how great it was. Things I'm listening to: I wouldn't be a human if I wasn't listening to "Feel It Still" by Portgual. The Man. My friend told me to listen to it a week or so ago but I just remembered earlier this week when Alfie Deyes was playing it on repeat in Zoella's Instagram Story. I've also been listening to "Quit" by Cashmere Cat and Ariana Grande because Ariana is queen and I didn't know this song existed? I'm also not ashamed to admit that I've definitely been listening to "I Don't Wanna Be In Love" by Good Charlotte a lot. Like, it's on heavy rotation in my car. IT WAS SUCH A JAM! I forgot that it existed. I forgot they existed, which is just a crime against the early 2000s. And last but not least, "Strangers" by Halsey and Lauren Jauregui (from Fifth Harmony) is a BOP. So, so, so good. Things I'm putting on my face: Still nothing, which I'm not sure if I should be proud of or embarrassed about. I probably should be putting on makeup, but honestly, I can't be bothered. However, when I do put on makeup, I really have been loving everything that I picked up from the drugstore that day and blogged about a few weeks later. More specifically, I've been in love with the Wet 'N Wild bronzer. It warms up my skin so nicely without streaking or making harsh bronzer lines on my face. It's the perfect shade for my skin, especially when I gently dust it when I would normally contour with a big fluffy brush instead of a precise sculpting brush. 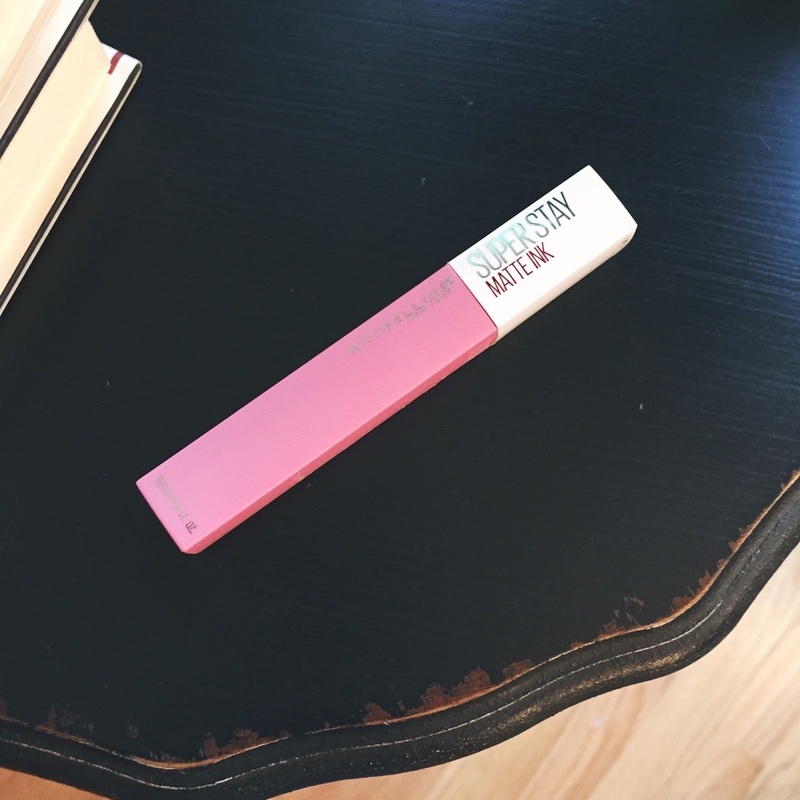 In that post, I didn't give the Maybelline Super Stay Matte Ink liquid lipsticks a bad review, but I'm not sure I gave them a good review either. Well, I got a second color in the mail the other day and I took my friends advice for application into considering when I applied. My biggest issue with it was that it felt so thick that it never dried down matte and started to get clumpy. She told me to apply a layer, blot it off and then apply a second layer on top of that. I tested it out with my new shade (Lover, which is a shade darker than Dreamer and is more rose tinted) and I fell in love. It dried down almost completely but had a little bit of a tacky feeling. It was something I could get over because it was so faint, but just beware if you hate that consistency. Even despite that, it was still mega-longlasting. I put mine on at noon and it lasted until I took my makeup off that night. I also had lunch, iced coffee, and dinner in between then without any reapplication. I haven't tried any of the darker shades, but the lighter shades get two thumbs up from me! Things I'm watching: Guys, I finally did it, I finally started watching Younger. My mom has been watching this show since the beginning and I, for some reason, wasn't into watching with her. Granted, I didn't have TV Land at school and I think Hulu just recently acquired Younger, but only the first three seasons. Last week I was out in the living room when my mom was watching and I think I nearly fell off the couch when Josh (Nico Tortorella) was on the screen. I mean, he's hot. He's beyond hot. He is on another level of hot. So, yes, I started watching from the beginning of season one that night and caught up with the entire series by Sunday. I am not ashamed. Younger, you just gained another fan because of Nico Tortorella. But also because I love Liza and her friendships with Maggie and Kelsey and UGH OKAY, JOSH IS BEAUTIFUL AND HILARIOUS TOO. But also if you don't know the premise of the show, basically Liza Miller is a newly single mom who moves from her suburban home in New Jersey to Brooklyn to live with her long time best friend. She tries to get a job in publishing after 15 years out of the game but can't get hired as a 40-year-old. Inspired by Josh's comments at a bar about how Liza looked like she was his age, Maggie helps transform Liza into a 26-year-old and subsequently gets hired at Empirical Publishing as an assistant to Diana Trout, head of marketing. There she meets Kelsey (Hilary freaking Duff!!!! ), a former assistant and now book editor who takes Liza under her wing and becomes her "age appropriate" friend. If you're looking for something new to watch and have Hulu, you can binge watch the first three seasons easily. They're all only 12 episodes and each episode is 21 minutes long. Do the math (because I can't). You can watch it all super fast. And right?! It's so fun to see her back on my TV! She's great in it!